The data is a very strong argument for removing the ceiling on Social Security payments — that is, collecting Social Security on 100% of wages, no matter how high (while not adjusting benefits). That’s because the Social Security system, now, assumes that life expectancy is the same for low-income and high-income workers, while in fact low-income workers collect benefits for far fewer years. So higher-income workers *should* pay more than they do today. That’s an interesting point, no? Fair is fair. (Though you can adjust that 100% to 90% or 95% or whatever floats your social equity boat.) And while we’re on the subject, the Congressional Budget Office recently issued a report (here) that includes a nice table that allows you to play the Social Security game from the comfort of your own home. 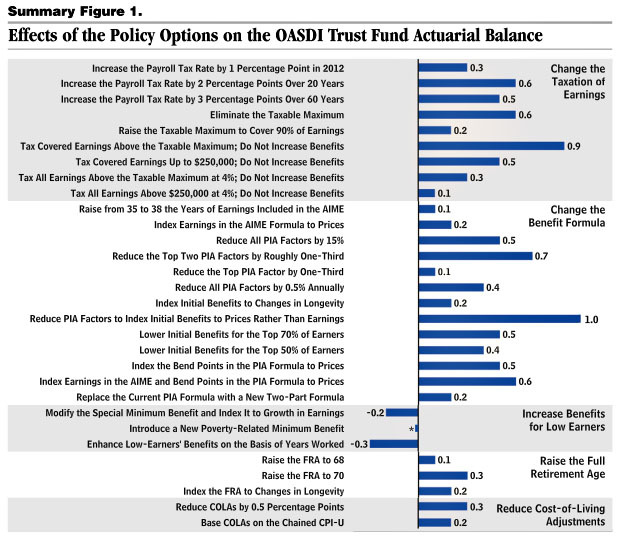 Basically, CBO estimates that Social Security is out of balance by 0.6% of GDP over the next 75 years, which means you need to come up with a basket of changes from their list that adds up to 0.6%. So choose away and build your own Social Security rescue plan! And when you’re done with that relatively trivial exercise, it’ll be time to move on to Medicare. Unfortunately, that’s a wee bit harder and no handy little table will provide the answers. Which, of course, is why people prefer spending their time on Social Security. It’s mostly grandstanding, but if they ever actually fixed it they’d have no choice but to tackle genuinely difficult problems. And what kind of moron gets elected to Congress to do that?